Digby being entertained in a strange manner! He has loads of toys, which he enjoys, yet bizarrely, Digby seems more entertained by an empty bottle! Obviously not a trick for him to be performing unsupervised by humans, but a strangely entertaining one! There are also photos of this outrageously cute little fellow here. .. whilst I’m planning on taking part in an insane multi-team, multi-ball football match to raise cash for the Royal British Legion, I’ve not done anything completely mad since I glasswalked last year. And whilst trudging around a muddy pitch on Hackney Marshes for two hours is quite mad – it’s not quite as extreme as some of my other activities. SCAD jumping – definitely going to look into this, indeed, it’s readily available in the UK! Power kiting – this looks cool, and I know a couple of people who are into it, so I’m sure I’ll be able to wangle something! Wing walking – bit of a misnomer, looks ace fun – prohibitively expensive, though! Bah. I guess announcements like this become less of a surprise, and more of a faff everytime I post them! My sincerest apologies for being such a leech! Once again I am embarking on silliness in the name of charity – this time round it is football. But not just any old football. Oh no. The match I will be playing in will last for two hours, and it will take place on the famous pitches at Hackney in London – the each match taking place on FIVE pitches. Yes. Five. Each team will consist of 30 people, playing in different “zones” in which you won’t be able to leave. If that doesn’t sound crazy enough, there will be FIVE footballs per match! All this craziness is to raise money for the very noble cause of the Royal British Legion. I would be hugely appreciative if you would sponsor me for my small part in this large event, and if you’re similarly crazy, then you might want to sign up to do it too! If 2 hours of gruelling insane-football wasn’t enough, I will then be further torturing myself by going to watch Forest take on Leyton Orient in the afternoon. But you don’t have to sponsor me for that. .. a decidedly contentious title, and not strictly accurate from this weekend’s shenanigans, so read on. We start with Nottingham City Transport, and the joys of the ‘city rider’ ticket. For a mere £2.70, Rich and I boarded a bus into town from Mapperley, and then onto a tram to Phoenix Park. Quite bargainous we thought. From there we hooked up with The Fakers and numerous other friends of theirs, and got onto a coach to Liverpool, where they were playing a gig in The Cavern. Now it’s true that upon driving into Liverpool itself, you do pass streets of boarded up houses and, shall we say, less than desirable areas – but my natural Nottinghamian disdain for Liverpool couldn’t cover up the fact that, even in the rain, Liverpool is actually blessed with a pretty impressive city centre – for all the problems the surrounding areas may have. Arriving in ‘pool at around 5pmish gave us time, after lugging the band’s equipment down into The Cavern, to have a wander – a Subway and then a few beers with Rich‘s Liverpool-based mates Fi and Joe, before heading back to the venue in time to catch a couple of bands before our boys were on. To say they weren’t really very good was an understatement, one was just a bit dull, the next band had the temerity to cover a Beatles song and forget half the words! (As well as a song which was basically Coldplay’s “Yellow” with different words). So to set up the stage of the Cavern – the epitome of Liverpoolness when it comes to music – with a Forest flag draped over the speaker, and introduce yourselves by announcing “Liverpool! Nottingham is in the area!” is, on the face of it, a pretty stupid thing to do – but well, if you were there then it was also fooking genius as well – Dave the singer was cunning enough to implicate us on the invasion too, which I suppose at least illustrated there were quite a lot of us if anyone fancied any trouble. Fortunately they didn’t. The gig was excellent from the Nottingham boys – they are, for those of you who’ve not seen them (and if not, why not? Get down Juncktion 7 on 31st January in Nottingham), a four-piece band a comprise of Dan Bennett, a suitably bonkers chap who transforms into some kind of drumming octopus when he takes the stage, Howard White – a guy who could probably run through a brick wall – on bass, Phil Swift is the calm presence on guitar and backing vocals, and finally Dave Marmion, an energy-filled and non-too-uncharismatic front man. They make up a tight unit, and to say they showed up the other bands on offer is an understatement – I was watching one of the other band look progressively more and more green about the gills as the set went on. The climax of the show was a mass stage-invasion from the Nottingham contingent for the last song, which certainly means that for those stoic and surly looking kids who were in The Cavern that night, The Fakers will live long in their memories if only as “that band that had the mass stage invasion at the end”. So definitely a case of Nottingham 1, Liverpool 0 – which is not the kind of boast we can often have over the reigning European City of Culture (one wag remarked this meant that now you’re likely to find your car propped up on books instead of bricks). After the boys had finished, despite being slightly intrigued by a three-piece band that comprised of two blokes who looked like Egon Spengler, we decided not to stick around and have a mooch around Liverpool for an hour before the bus picked us up. So a kebab and a portion of chips later, that’s what we did – wandering around the area of The Cavern to the Albert Dock area, and back again – taking in such sights as the hotel Formula One, where John Barnes allegedly took prostitutes (it’s pretty much an unstaffed hotel, you book online and get a ‘code’ to get into your room, you see), to the fantastic dock-side area. As when I visited Manchester in October, it did make me a bit jealous, and realise what a forward-thinking council can achieve if it puts its mind to it. Walking the streets wasn’t in any way threatening, it was full of people having a good laugh – which is often not the case in my dear home town. Their new dockside arena looks absolutely ace from the outside, now compare that to our fairly drab ice arena – which architecturally lacks any kind of appeal whatsoever, despite being a decent venue. We got back to the bus, and awaited some of our more wasted travellers to find us – thus enjoyed a spot of people watching, there were transvestites, a terrifying array of Liverpudlian womenfolk who were apparently impervious to the cold, and a brick-shithouse bloke rather amusingly wearing dungarees… to name but a few. Eventually we were finally underway, there was a brief singalong with an acoustic guitar, and lots of banter, before Rich and I were finally back on the streets of Nottingham, and faced with the police calming down a bunch of youths, and further sirens heard in the distance. I discovered my car’s trip computer automatically logs your current journey – ie, when the ignition started until you stop. And I’ve become transfixed with the mpg rating which updates as you drive, and have been cunningly attempting to maximise fuel efficiency when commuting (which isn’t really the most efficient way to use fuel anyway) – but assuming the onboard computer is accurately calculating it, it’s amazing how quickly you can make a fairly significant impact on how long your fuel will last. … so there you go, a new game when you’re bored on the way to work to play if your car yields similar information, see if you can get to work with the highest mpg rating yet – and you’re not only saving yourself a bit of cash over time, it’s good for the environment too. Of course, make sure you actually watch the road too, otherwise you might find yourself embedded in a large stationary object, which I wouldn’t recommend! Digby, the cutest dog in the world? Check out this outrageously cute little fellow, his name is Digby, and he’s my aunty’s new dog – he’s a Labradoodle puppy. Which is quite possibly the best dog-breed-name there has ever been! It got us thinking earlier about other potential breeds of dog you could create by integrating the ‘oodle’ of poodle into the equation.. 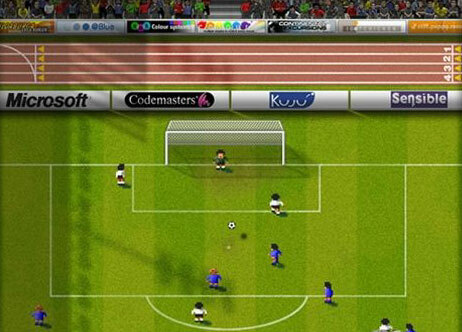 I remember reading a while back that Sensible World of Soccer – a game that consumed literally days of my childhood – was being made available on the XBox Live Arcade. That was quite an exciting announcement, and as today I was at a bit of a loose end I was using the 360, and just so happened to click through to the featured games on the Game Marketplace – and duly found it! The game is basically pretty much as it was back in the day on my trusty old Amiga – although it’s been expanded to fill a 16:9 screen, which is good! The biggest pitfall, though, is the player names. Often the problem you get with any football games is licensing fears over using players names – so to get around this, this game has basically mixed up the vowels and changed their initial. That’s quite irritating, as obviously it would take a high degree of editing to get them all just right. It’s quite refreshing too, to play a football game that only needs one button to do everything, of course, it’s not as elegant as Pro Evolution Soccer or FIFA, but that’s why it’s brilliant! The other brilliant thing is that Forest are in the Premiership in it, it’s that out of date! So I can reminisce over the times when Campbell (Compbill) and Roy (Riy) lead the line for the Reds! I’ve had a chance to have a good fiddle around with the XBox 360 today – so I also discovered that they’ve created a movie-rental system, including high definition films that you can download from XBox Live and play from the harddrive – I tested this out by downloading The Matrix in high definition. This is the first time, aside from 360 games, that we’ve ever tested the HD capabilities of the telly in anger – and I’m impressed! The final thing I’ve discovered more about is getting the console to stream media from the PCs on the network in the house. I’ve successfully had it playing our mp3 collection, as well as a video file from the PC and slideshows of photos. It’s very impressive. The next phase for is to get it to properly sync with Windows Media Center on my laptop – currently it’s 60% or so through doing this, having checked out more than 10,000 media files! I shall update on my success or otherwise. See what happens to me when Forest don’t play of a weekend? … having had my new car for a while, it’s weird how many other ones like it I’ve noticed all over the place. It’s a cunning link from the last post about tricks of the mind really. Next time you’re with a group of friends, ask them to take 30 seconds to make a mental note of everything a certain colour in a room – say, red – if there’s some red stuff in the room. After the time, ask them to close their eyes, and then describe the blue things in the room. Unless they know what you’re up to they should really struggle with it (again, make sure there are some blue things in the room – plenty of them), because their mind filtered them out whilst concentrating on the red things. It’s a bit like that – before I had the car I noticed hardly any like it, even when I knew I was getting it, in the past I or family members have got new cars – I remember Dad getting a Focus that was a metallic light green – we thought it was terribly original – soon after we saw Focuses (Focii?) everywhere in the same shade of green… and similarly, now my new car is here and has been made relevant in my subconscious – it means little signals go off whenever I see one now, making it seem like there are suddenly more of them – when there aren’t. Isn’t it odd how your mind filters things out until you make them relevant to yourself and suddenly you start to register them everywhere. I think this selective blindness must have been at play in reverse for the clueless buffoon of a referee who gave Huddersfield a penalty against Forest on New Year’s Day! You’ll all know Derren Brown as a singularly scary dude. As someone who likes thinking, and challenging the way I think, I find him quite interesting – so it was nice to get his latest book for Christmas, and having read it, it proved very thought provoking. I already made mention of a nifty card trick, revealed early in the book (although if you decide to buy it, then indulge me if I try it out on you!) which was cool – but it wasn’t all to do with teaching nifty tricks or revealing how his seemingly unnatural mind skills work. Although, as someone who’s interest is piqued by otherworldly things, on some level the book was quite disappointing. You see, Derren basically reveals that he’s attained the skills he has through little more than study, practice and more practice, and melded those learnings and practice with no small amount of charisma – which is pretty essential for any kind of show business type endeavours. He also offers candid and interesting insights into the state of the world too. So all in all, for a bloke of mystifies us – or me at least – with his apparent skills on TV, his book rather demystifies things. Although he doesn’t give enough away to mean the streets will be awash with Derren Brown impersonators, thankfully! I’d recommend picking up a copy if you’re remotely interested in that kind of thing, it was a jolly good read – so long as you can put up with his artsy fartsy language!